The 10th U.S. Circuit Court of Appeals ruled 3-0 that a judge in Oklahoma City erred by throwing out the lawsuit of Keith Cressman, pastor of St. Mark's United Methodist Church in Bethany. 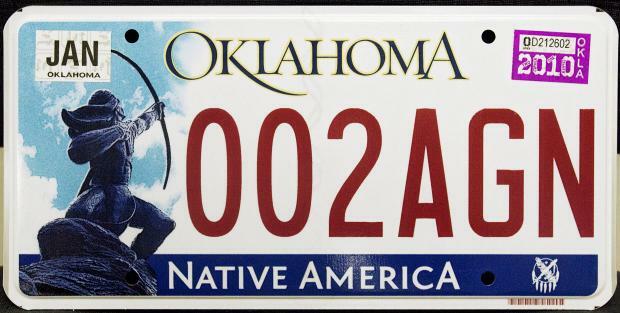 By Robert BoczkiewiczAn appeals court gave new life Tuesday to a lawsuit of a Bethany pastor who claims an American Indian image on Oklahoma's standard license plates violates his religious rights as a Christian. And:“Mr. Cressman's (lawsuit) states a plausible compelled speech claim,” the appellate judges wrote Tuesday in a 39-page decision, reversing Judge Joe Heaton's dismissal of the lawsuit. “He has alleged sufficient facts to suggest that the ‘Sacred Rain Arrow' image on the standard Oklahoma license plate conveys a particularized message that others are likely to understand and to which he objects.”Comment: As noted in Oklahoma License-Plate Challenge Dismissed, the judge who dismissed the challenge was right to do so. I trust the judges will rule against Cressman again once they rehear the case. His arrogance and extremism is similar to the intolerant bigots who can't say BE / AD and use "BCE, CE". This is pretty odd also since the UMC is a rather liberal/tolerant denomination of Christianity. I'd like to ask this guy if his blood pressure gets up when he writes Friday or Thursday in correspondence. After all, they both refer to the Norse faith. In a way, this reminds me of "men's rights" activists who basically spend all their time complaining about FEMINISM!!!11! !1cos(0) and how it's why they're single. I wonder how he feels about the Ten Commandments outside court houses.